Will You Be Watching The First Presidential Debate? Regardless of how you feel about either of the major party presidential nominees, you have to say that things have certainly gotten very interesting. Speaking of which, the first presidential debate will be held Monday, September 26, at Hofstra University, Hempstead, NY (my alma mater! ), and you can guarantee that a whole lot of people will be tuning in to watch. According to Nielsen, six of the top 10 debates by household viewership numbers occurred within one of the last three election years. Of those six, President Barack Obama has appeared in five of them—and the initial debate of the 2012 election, featuring him against Mitt Romney, currently holds the top spot. Until the 2012 election, the top spot once belonged to the historic 1980 debate between Jimmy Carter and Ronald Reagan. 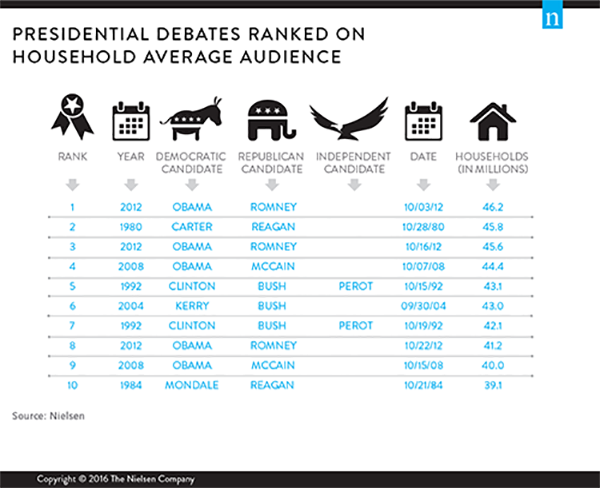 At 45.8 million households, the lone presidential debate of the 1980 election maintained the top spot for nearly 32 years, according to Nielsen. Let’s see if this year’s debates break the record! The New Fall TV Season Is About To Begin! I can’t wait! The 68th Primetime Emmy Awards is on Sunday, September 18, and then the following day the new TV season really kicks off! I’ve been waiting all summer to see new episodes of my favorite shows, like The Big Bang Theory, NCIS, and Grey’s Anatomy. I’m sure most of you can’t wait either, since they are a lot of TVs out there. In fact, according to The Nielsen Company, for the 2016-17 TV season there are 118.4 million TV homes in the United States. Nielsen also estimates that there are 301.7 million people age 2 and older in those TV households. That’s a lot of potential viewers. Let me know which shows that you are most looking forward to seeing this coming TV season. Happy TV watching, and have a great day! The National Football League kicks off its 2016 season tonight. Like a lot of people, I love watching football. Despite being so busy, my family and I try to watch every week – especially our beloved Jets! As you probably know, professional football is BIG business. According to Forbes.com, the NFL’s total revenues are projected to top $13.3 billion this year, an increase of more than 50% from 2010. This is far and away the top revenue total among American sports, with baseball coming in a distant second at $9.5 billion, the National Basketball Association in third place with $4.8 billion, and the National Hockey League in fourth at $3.7 billion. Also, take a look at the NFL’s most valuable teams. Talk about a lot of money! I hope you’re ready for some football. Let me know which team is your favorite. Have a great day, and settle in for the kick off! My family and I just got back last week from our vacation to Orlando, where we went to all the major amusement parks. We all had a great time, but now it’s back to work! Speaking of work. … This Monday is Labor Day, where we pay tribute to the achievements of the American worker. According to the U.S. Census Bureau, there were 158.5 million people age 16 and over in the nation’s labor force as of May 2016. Since we love stats here, I have a few others I’d like to pass along, all labor related, of course! One thing that many people complain about is their commute to work. According to the U.S. Census Bureau, on average it takes 26 minutes for U.S. workers to commute to work; however, New York (32.6 minutes) and Maryland (32.3 minutes) have the most time-consuming commutes. Labor Day also marks the end of the summer and the start of the back-to-school season. So make sure to really enjoy this “last weekend” of summer!